JVG also makes the case for Yao’s HoF worthiness to the Houston Chronicle’s Jonathan Feigen in this story. This video montage is a great retrospective. This 1-on-1 interview with Gary Chow is pretty good. I know it’s been a long time since my last post since things have been so quiet with Yao for such a long time. But I was blown away with the retrospective that Yahoo’s Adrian “Woj” Wojnarowski was able to get from Yao as he reflected back on his career during the 2016 All Star break in Toronto. Below is the entire podcast, and here’s the link to Woj’s “The Vertical” page. This ABC news story appeared last week in the Bay Area after Yao visited his winery in Napa Valley. Check it out! If the video player above doesn’t play the video, you can try viewing the video here. Yao Ming was in esteemed company Saturday, June 8th, when he was interviewed on stage at the Fortune Global Forum in Chengdu, China. Here’s a transcript of the interview. When asked who he thought would win the NBA Finals, Yao diplomatically skirted answering the question, but he did say he was a Spurs fan. This is probably due to him playing the Spurs so many times over his 8-year career — he can’t help but respect how they play the game. It just goes to show that even though Yao retired a few years ago, he still remains a global force as an entrepreneur, philanthropist, and de facto ambassador for China. As the Fortune web site describes, the Fortune Global Forum is the highest-level place for multinational CEOs—and the heads of China’s most important companies— to gain visibility into the emerging new trends, and meet the people that are shaping “China’s New Future.” It represents an unparalleled opportunity to build the key relationships and obtain insights that are vital to positioning multinational companies for long-term success, in China and on a global basis. Here’s a list of all the speakers at the Global Forum. Pretty impressive names there. You might remember my post from a couple days ago where I posted some photos of Yao having a conversation with Jay Williams at the Asia Society of Texas located in Houston. Well, the good folks at the Asia Society posted a video of almost the entire interview, which is very informational, as well as humorous! Click here to check it out, and consider joining the Asia Society — their mission is a very worthy one. There hasn’t been much to report about Yao over the past couple of months, but we finally have a few updates for you. Last week Yao was in South Korea for the Special Olympics World Winter Games since Yao is still a Global Ambassador for the Special Olympics. Below he is pictured taking part in a snowshoe relay, which he says is the first time he has tried a winter sport. Also participating was his wife Ye Li, and international movie star Zhang Ziyi, pictured below. 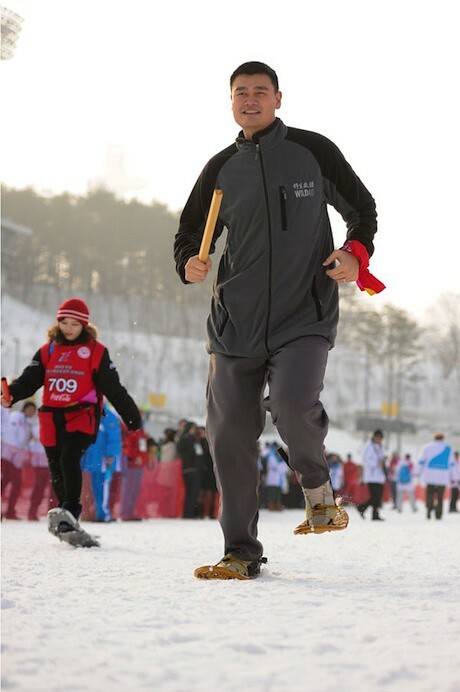 Click here for more photos of Yao and others running in the snowshoe relay. 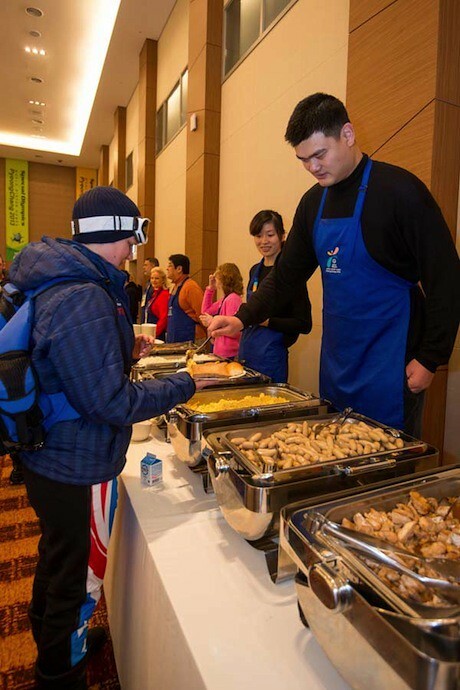 The next day Yao and his wife served breakfast for the special athletes. Click here for more photos of Yao serving breakfast. 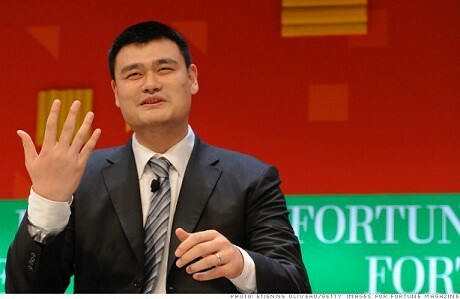 In case you missed it, last week the Washington Post published an interview with Yao. They provide a pretty good recap of Yao’s life after retiring from the NBA, his relationship with Jeremy Lin, and the state of basketball in China. It’s highly recommended reading. Check it out here. Yao is now in Houston for next week’s NBA All-Star festivities where we plan to cover some of his activities here on YaoMingMania. In addition, on Friday the 15th in Houston at the Asia Society of Texas, non-members can purchase tickets and hear about Yao’s career and his rise to global icon status during a private luncheon. Guests will also get a taste of the first vintages of the Yao Ming Napa Valley Cabernet. Click here for more details. So it was no surprise that as Lin figured out his future, seeking millions on the free-agent market while trying to remain loyal to the Knicks, he consulted with Yao. This time, Yao said, he was of only limited help. Lin’s decision to sign an offer sheet from the Houston Rockets, Yao’s former team, and the Knicks’ decision to let Lin go, set off a fierce debate in New York. Yao, for his part, thought the outcome was ideal. Yao recalled that the environment in a smaller market helped make him a better player. In eight seasons, all with the Rockets, the 7-foot-6 Yao averaged 19 points, 9.2 rebounds and 1.9 blocks as a center. The Rockets hope that Lin, who is of both Chinese and Taiwanese descent, can continue the franchise’s popularity in China, for which Yao was responsible. For more information on the Yao Foundation and its new conservation initiatives, click here. Big Yao surprised everyone by flying to Houston this week and was courtside at the Rockets-Lakers game. 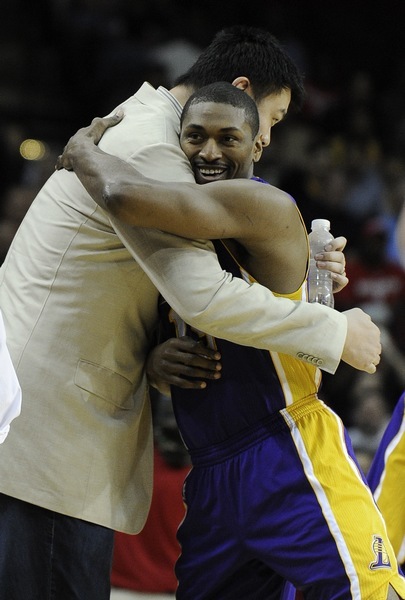 Below he hugs former teammate Metta World Peace, the basketball player formerly known as Ron Artest. Click here for a video interview that Yao gave to the press before the game. As always, he was hilarious. Fortunately for Rockets fans, the team made a great fourth quarter comeback to beat the Lakers. You are currently browsing the archives for the *Interviews with Yao category.